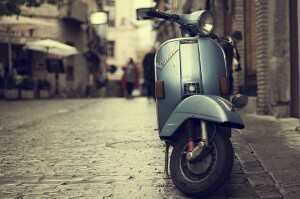 Vespa scooters are an integral part of Italian society and have been a strong cultural icon since they exploded onto the market almost 60 years ago. The Piaggio Company in Pontedera, near Pisa, manufactured the first Vespa scooter in 1946 to address the need for a low cost transportation solution in post-war Italy, a time in which Italy’s economy was in dire straits and roads damaged from bombings had led to decreased automobile manufacturing. Today, not much has changed from the breakthrough original design. Elements of the Piaggio Company’s aeronautic manufacturing influence can be seen in the aerodynamic front protection shield and compact, streamlined body shape. Following the scooter’s public debut at the 1946 Milan Fair, marketers and consumers were at first hesitant to embrace Vespas. Sales dramatically increased by 1948 and soon were increasing exponentially each year. By 1950, production had spread to foreign markets, and the Vespa solidified as the Italian symbol of fun, freedom, youth and imagination. Their low running cost, ease of use, maneuverability and wide range of colors and customizations made them popular with young people and adults alike. In 1952, the Vespa made its Hollywood debut in “Roman Holiday.” After Audrey Hepburn and Gregory Peck rode through the streets of Rome on a Vespa, scooters became a worldwide cultural phenomenon. By this time, worldwide Vespa Club membership had reached 50,000 and the Vespa had become an icon and primary mode of transportation for mods and punks in Britain. Celebrities such as Marlon Brando and Dean Martin were well-known Vespa owners of the era, contributing immensely to the creation of the scooter’s image. As Vespa’s popularity skyrocketed, many more models and styles were introduced, and though many other companies such as Lambretta and foreign companies like Bajaj from India popped up in the market, Piaggio has remained the top brand over the years, due to serious brand loyalty from its buyers. Walk just about anywhere in Italy and you will see traces of Vespa culture: kids walking together clutching scooter helmets, lines and lines of scooters parked along the sidewalks, scooters zipping past busses and cars along crowded narrow streets, and countless small specialty mechanic shops on every corner. The Vespa transformed Italians’ ideas about leisure and transportation and remains an eternal symbol of Italian history and culture that continues to remain relevant and popular to this day.